Moffat 2000 designs and manufactures subsea pipeline products including stab connectors for flushing or pig-driving operations. Wilde was asked to characterise the pressure-flow relation of various sizes and orientations. The project was to determine loss coefficient for different size connectors and to establish dependence on orientation of the connector in the line. A model of each unit was generated in ANSYS DesignModeler by cleaning up an imported CAD file supplied by the client. 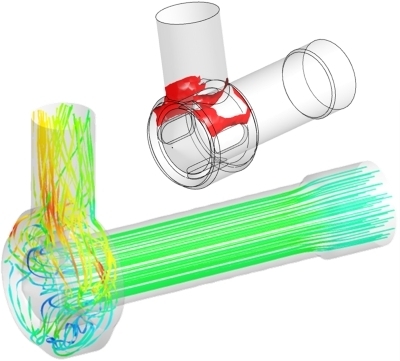 Meshes were generated with ANSYS CFX-Mesh and CFD simulations conducted using ANSYS CFX V11 . The model consisted of the internal passages of the connector and a downstream length of pipe, representing the unit under test. Post-processing identified the chief source of losses and design improvement recommendations under ambient pressure test conditions. The project generated confidence in CFD to evaluate designs and replace expensive high flow rate prototype testing.